Standard product : Integral heavy duty hoop, four stainless steel wires, stainless steel snap swivel clip. BS Standard International Orange, High Tenacity Polyurethane coated nylon with U.V. inhibitor. Guaranteed from manufacturing defect for 1 Year from date of purchase if flown from a suitable Mast & Swivel Assembly. 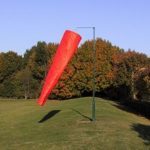 For a full range Windsock upgrade Options click on Windsock Options.